Spawned from country music performers in the Connecticut city of Bridgeport, Vincent Cusano quickly developed an interest his parent's vocation, beginning his study of the guitar by the age of ten. During his teens Cusano kept active in a variety of local bands, and after graduating from high school took up a position as a guitar teacher at a music shop. In 1976 his recording career started off in low gear with the song Happy Birthday U.S.A. (done in collaboration with keyboardist David Wolff) and some session work for the band Hitchhikers. The following year he landed the role of lead guitarist in Treasure, a project founded by former vocalist for The Young Rascals Felix Cavaliere, but the band dissolved soon after the release of their eponymous album on the Columbia label. Throughout the remainder of the decade Vinnie maintained a living through sessions for performers like Laura Nyro and Dan Hartman, as well as a stint as staff songwriter for the televison series Happy Days. A breakthrough for the musician arrived in 1982, courtesy of the substance abuse problems plaguing Kiss guitarist Ace Frehley. While working the previous year in the heavy metal band Warrior, an association had been established with Kiss founder Gene Simmons; fed up with Frehley's erratic behavior, Simmons now turned to Cusano to take up the slack both as a songwriter and a guitarist for the 1982 Kiss release Creatures of the Night. 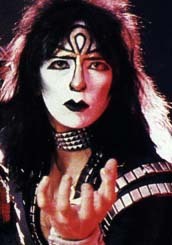 Once Frehley had bowed out for good, Cusano was the obvious choice for a replacement: adopting the name Vinnie Vincent, and painting himself up with a silver and black ankh designed by Paul Stanley, he took up guitar duties full-time for the Creatures of the Night associated world tour. He remained on board for 1983's Lick It Up and the band's first "make-up-less" tour, but during the preliminary stages of the next effort Animalize (1984) financial disagreements between Vincent and the other members resulted in a parting of ways. After his tenure in Kiss, Vincent put together Vinnie Vincent Invasion -- a pop metal combo featuring future Slaughter personnel Mark Slaughter and Dana Strum. Two albums were released under the Chrysalis imprint, Vinnie Vincent Invasion (1986) and All Systems Go (1988), before Slaughter moved on to his more successful self-named band. Vincent then attempted a solo career (which never quite materialized) and continued with his songwriting work, collaborating with The Bangles (of all people) on the track Make A Play For Her Now (found on their 1988 release Everything). Songwriting work with Kiss was resumed in 1992 for the album Revenge, but any goodwill that lingered between him and his former bandmates was wholly smothered a few years later when he served a seven-figure suit against them for neglect of royalty payments. In the 00s Vincent kept a low profile, making occasional guest appearances on the Kiss convention circuit.